Programme started at 10.30a.m. with Shishuvihar UKG students leading the prayer which was followed by the lighting of lamp by the Chief Guest and the members on stage. Dr. M.S. Muralidharan, Director of Hindi Prachar Kendra, Kodungallur, was the Chief guest for the programme. The whole programme was conceived and executed by the parents of Sandeepani Sishuvihar. The Chief Guest in his speech stressed the importance and need of the hour for value education which would help children in the long run as they grow up and start planning for their future and goal in life. They would then effortlessly use their discriminative power to follow the path of sreyas rather than fall prey to the numerous evils of the present. Hence more and more children should be introduced to spirituality and not mere academics. He was full of praise for the selfless service rendered by Mananeeya Didi who is a friend, philosopher, and guide for the people who approach her. 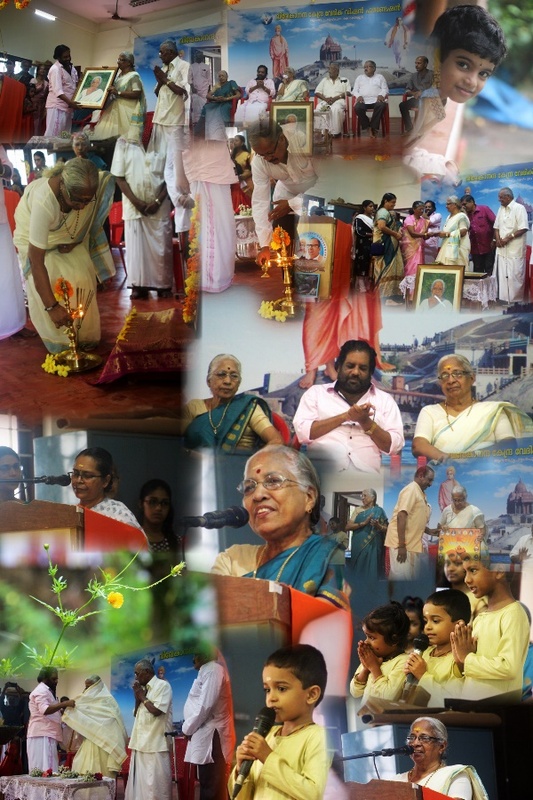 Others on the dais were Sri Gopalankutty Menon, a retired teacher and poet, Smt Anandavalli, retired teacher of OK school,Kodungallur, Dr. Sanjeev Prabhu Parent representative, Major Gen. Dr. Vivekanandan (Retd) a close well-wisher of Vivekananda Kendra and Mananeeya Lakshmi Didi. Didi was honoured with a Ponnada by the Chief Guest and 'Mangalapatra' by Sri Gopalankutty Menon a well-known poet, popularly known as 'Nimisha Kavi'(one who can compose poems instantly). Many well-wishers expressed their happiness that Ma. Didi was chosen for the AmritaKeerti Award. Among them who congratulated her, were counselors of Kodungullur Municipality Smt Asha Latha, Smt Parvathy, Smt. 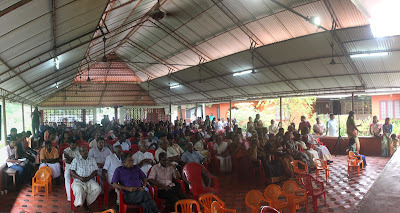 Rekha, Sri Shaji principal of HDPY School, Andipilikavu, Sr Venugopal, President OKAY Yogam, etc. The representative of the parents Dr Sanjeev Prabhu, informed of the plan to build a small children's' park in the premises of Anandadham campus for the Sandeepani Sishuvihar children as a tribute to Ma. Didi. Everyone was requested to contribute wholeheartedly to this Project. The first contribution was by Smt. Shanta Devadas and Sri Devadas, parents of Kum. Lakshmi an alumnus of Sisuvihar(first batch). Sri Shally introduced Ma. Lakshmi Didi to everyone present. Kum. Drishya and Smt. Jaya Radhakrishnan meticulously anchored the program. Ma. Didi expressed her gratitude for the love and affection showered on her. Didi emphasised on the opportunity that she got to play(even though trivial) in the conservation of the India's culture and heritage. She requested one and all to give a portion of each of their time for the welfare of others, and join them in their times of joy and be a pillar of comfort and hope in times of sorrow. The programme concluded with Shantimantra. Everyone dispersed after a sumptuous lunch.